SpineMED® - Salem Chiropractic Center, P.C. ​Tired of Living With Back or Neck Pain? SpineMED® is a safe, non-surgical, drug-free procedure for: Herniated Disc, Degenerative Disc, Sciatica, Radiculopathy, Facet Syndrome, Spinal Stenosis, Pre / Post Surgical Patients. Back and neck pain are the number one complaints in North America, affecting 80% of us at one time or another. These problems often mean a permanent loss of some function, forcing us to give up things in life no one should have to give up. What does Spinal Disc Decompression do? All procedures are administered with the patient fully clothed. For lumbar procedures, the patient is comfortably positioned on the table, and the (patent pending) Pelvic Restraints are adjusted to comfortably secure the patient’s pelvis. The upper torso is captured by a comfortable securing system incorporated into the fixed section of the table. The Pelvic Tilt section will be electronically tilted, so that specific spinal segments can be targeted. With precise and pain-free computer controlled tension, the specific disc segment is gently distracted. For cervical procedures, the cervical unit is first electronically tilted to the angle required to target specific segments of the cervical spine. The patient is then placed on the table with their head positioned in the cervical cradle unit. The Cervical Restraints (patent pending) are designed to comfortably capture the base of the patient’s skull for controlled distraction. A typical daily session consists of 30 minutes of decompression on the SpineMED® Table followed by 15 minutes of ice therapy. The process is pain-free and safe, and it is not uncommon for patients to fall asleep during the procedure. The average recommended course of SpineMED® procedure is 20 sessions. Ideally, the sessions are performed daily with rest on the weekend. At the conclusion of the procedure series, patients are given mobilization and strengthening exercises to avoid further injury. Spinal Disc Decompression with the SpineMED® Table has shown to be safe and without side effects or complications once abnormal conditions have been ruled out. 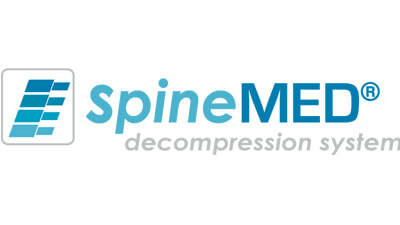 Patients with conditions that compromise the integrity of the spinal column, such as gross osteoporosis, fractures, tumors, or congenital pars defects are not candidates for SpineMED® Spinal Disc Decompression.